Escada Especially is a luxury, according to women's active and spontaneous. Escada Especially 75ml. Eau De Parfum is a luxury, according to women's active and spontaneous. The dominant scent is the essence of the rose, and the heart is composed of fresh aquatic notes and sensual ylang-ylang flowers. Top notes are composed of pear flavors that highlight the freshness fragrance. 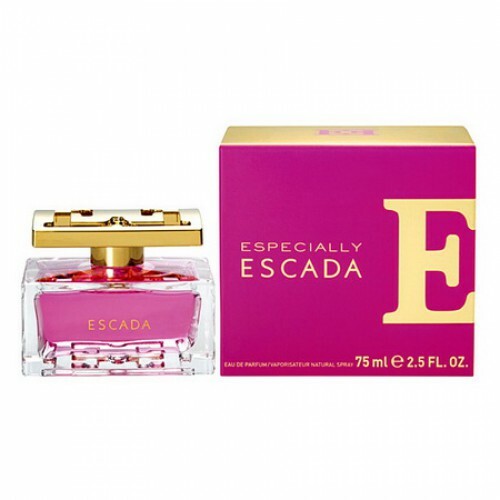 Especially Escada was launched in 2011. this fascinating new fragrance from Escada. Luxurious and feminine composition inspired by way of modern, fun, spontaneous and sensual woman who allows herself to show emotions. She has a positive attitude to life, she likes to have fun, but always remains true to herself.Sophisticated, elegant and feminine fragrance Especially Escada is built on a noble note rose. Composition inspired brilliance of the morning dew on the delicate petals of a flower, it makes the fragrance-luxurious ease. Top notes - chord intense sparkling pear and exotic musk ambrette seeds. This combination creates a splash of bubbly and go to the heart of the idyllic flavor. Heart notes - the freshness of the morning rose, dewy. Unique delicate aroma petals collected at dawn. Supplementing rose ylang-ylang flower exudes a soft appeal. This chord gives the flavor and freshness of the aura of joy and happiness. Base notes - light musky accord emphasizes elegant floral bouquet and flavor gives fullness and sensuality.